Did Someone Say, ‘Nathan’s Famous’? I’m getting this in just under the wire. Alas, that’s ‘under the wire’ for ME. When anyone else reads this blog post, it’ll probably be tomorrow instead of an hour shy of tomorrow, and thus TOO LATE for you to do what I just did. 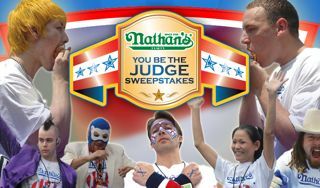 That is, enter the ‘Nathan’s Famous You Be the Judge Sweepstakes‘ for a chance to be a judge at this year’s Nathan’s Famous Fourth of July International Hot Dog Eating Championship. I wasn’t trying to be stingy about sharing this chance to be picked as one of two grand prize winners. Sure, I’d like to be chosen to be a judge for the contest. Heck, yeah! 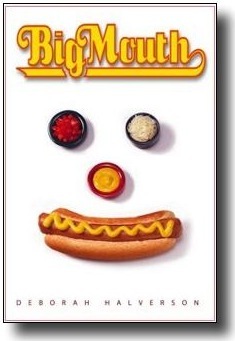 That’s the subject of my second novel, BIG MOUTH, after all. I just didn’t read the email from the Nathan’s Famous marketing director very clearly last week and thought I had to play an online game to enter instead of just signing up, and I didn’t have time to do any gaming until now. I fully intended to do as the marketing director asked and promote the contest, but I wanted to actually go through the entry process before I blogged about it. So, to anyone who cared enough to enter, I’m sorry for my terrible reading skills. It’s these darned eyes… my updated contacts haven’t arrived from the eye doctor yet, and looking at this new (read: untame-ably bright) computer screen is downright painful with this old prescription. So, if you want to be a judge, just go to the sweepstakes website and type in your email address, name, phone number, and address. According to the contest press release, two winners will be drawn on or around June 1 for this year’s July Fourth contest. Hey, wait! “On or around”? Maybe you won’t be too late. Maybe they’ll take the “around” part to heart and draw the winner some time next week instead of tomorrow? Ooh, a loophole! Hurry, go to the website and sign up for your chance to judge grown adults shoving hot dogs and buns into their mouths faster than any Hoover could ever do. What an opportunity! And if you’re not in time, at least I didn’t sabotage you completely: The contest folks will draw again “on or around” September 7 for the 2011 contest judges.